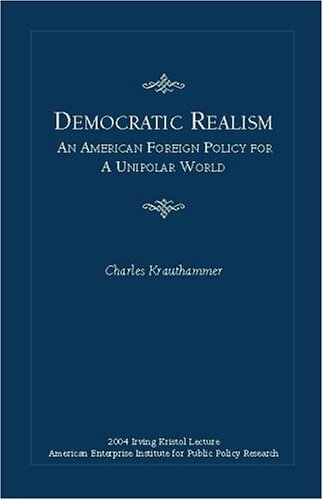 In this essay, delivered as the Irving Kristol Lecture at the American Enterprise Institute in February 2004, Charles Krauthammer examines four contending schools of American foreign policy: isolationism, liberal internationalism, realism, and democratic globalism. After analyzing the sources and merits of each school, he concludes that a variant of realism and democratic globalism, which he calls democratic realism, is best suited to America's position of preeminent power and the challenges of confronting and subduing Arab-Islamic fanaticism. We will support democracy everywhere, but we will commit blood and treasure only in places where there is a strategic necessity_meaning, places central to the larger war against the existential enemy, the enemy that poses a global mortal threat to freedom. When you hear that someone you deeply admire only has several weeks left to live, it creates a special opportunity to offer inspiring words -- and heartfelt thanks. Krauthammer's musings on cold war gamesmanship, psychiatry, and the Reagan Administration.